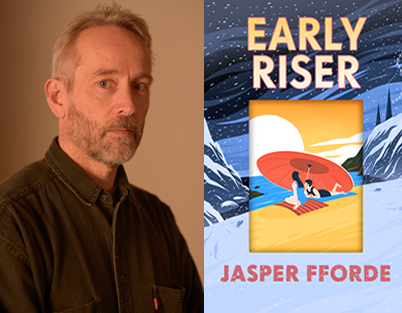 Join us for an evening with Jasper Fforde, one of Britain’s most original writers, as he talks about his highly anticipated new standalone novel Early Riser. A new Jasper Fforde novel is always a major event. But he’s made his fans wait for Early Riser which has taken longer than any of his previous novels to write. The wait is over – it publishes in the UK on 2nd August! Jasper has created an extraordinarily rich and Ffordian new world for Early Riser where every winter 99.9% of the human population goes into hibernation, protected by an elite corps of Winter Consuls. For five months a year while people sleep the Winter Consul are the law. say there are no heroes in Winter, and Charlie is about to find out why. Jasper’s imagination, creativity and humour is unique, and we are thrilled to welcome him to Oswestry as we wait to discover the world of Early Riser.